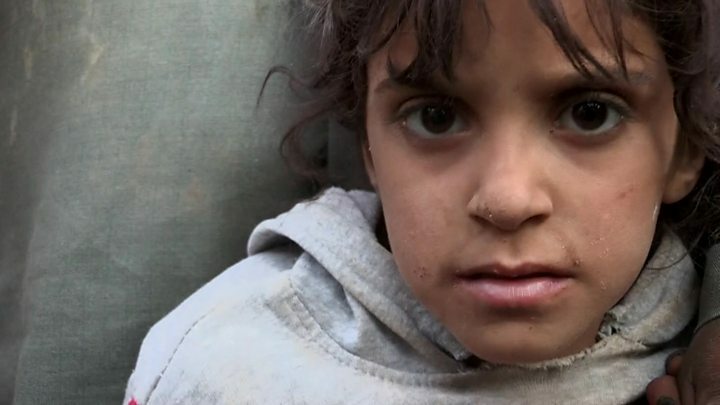 Syrian pro-government forces backed by Russian airpower are advancing rapidly towards a border town still held by the Islamic State (IS) group. A day after taking full control of the city of Deir al-Zour, the Syrian military is mounting an offensive to recapture the town of Albu Kamal. Reports suggest IS fighters fled there from the Iraqi side of the border. An Iraqi Shia Muslim militia has said it will cross into Syria to join the assault on Albu Kamal. 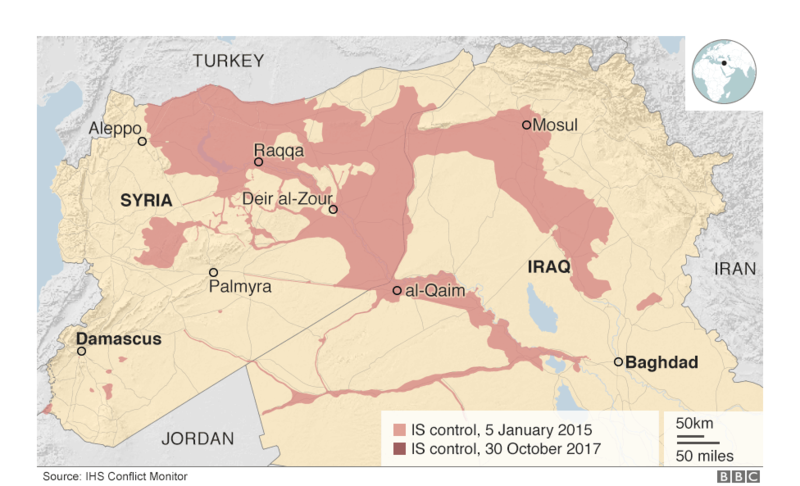 It is a sign of how dramatically IS territory has shrunk in the past few weeks that this town on the border with Iraq appears to be one of the jihadists' last redoubts, the BBC's Sebastian Usher reports. It is unclear how much co-ordination there could be between Iraqi and Syrian pro-government forces but the aim appears to be to deny IS fighters - and presumably their surviving commanders - the chance of escaping into the remote desert wastes as their self-declared caliphate crumbles into dust, our Arab affairs editor adds. Russia, after Iran, is the other great winner from the Syrian conflict, reviving its role in the region, securing important military bases, and making itself a key diplomatic player. It wants to "solve" Syria on its terms and with its favoured actors ending up the victors and it seems to be well on the way to achieving this goal. But the growing proximity of Russian and Iranian-backed pro-regime forces and those backed by the US raises the possibility of some dangerous encounters. The US and Russia can agree on the need to defeat IS but on little else. Moscow's "side" has the military and diplomatic advantage on the ground. Will the US seek to bolster its position in Syria, perhaps as part of a broader policy to "roll back" Iranian influence, as US conservatives are hoping? This may be easier said than done and might require many more resources and boots on the ground than the Trump administration is prepared to put in harm's way. On Friday, Iraqi Prime Minister Haider al-Abadi announced that the Iraqi border town of al-Qaim, close to Albu Kamal, had been recaptured by government forces. The same day, the Syrian government said it had retaken Deir al-Zour, capital of the region of the same name in which Albu Kamal is located. Russia released video of bombers in action and missiles being launched from a submarine in strikes targeting the Albu Kamal area. A spokesman for the Kataib Hezbollah militia, an Iranian-backed Iraqi group fighting alongside the Iraqi army against IS, told Lebanese TV the group would join the fight for the town across the border. "Albu Kamal is in missile range of the Iraqi forces in al-Qaim," Jaafar Hussaini was quoted as saying by Reuters news agency. "The presence of our forces on the border with Albu Kamal means there will be a new front in the confrontation with Daesh [another name for IS]." 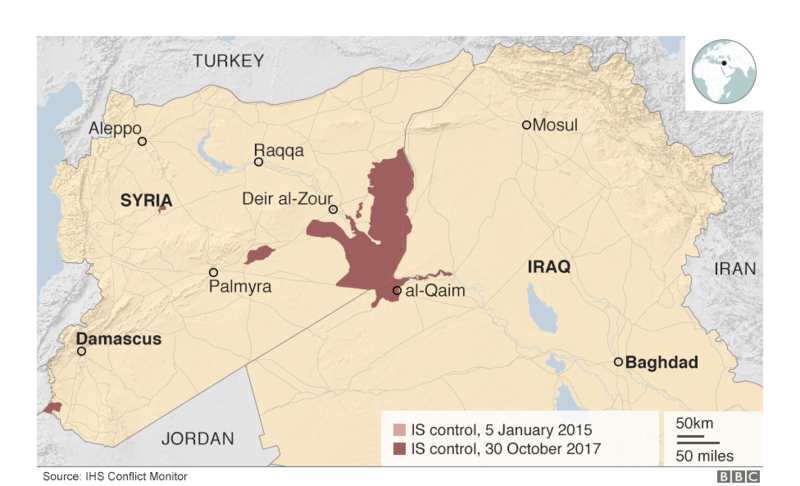 IS, a Sunni Muslim jihadist group, overran swathes of Iraqi and Syrian territory in 2014 and enforced its rule through ruthless suppression of its enemies, earning international condemnation for its cruelty. It has also claimed responsibility for numerous attacks outside he region, notably the downing of a Russian airliner over Egypt with the deaths of all 224 people aboard in October 2015 and the killing of 130 people in a gun and bomb attack on Paris two weeks later.